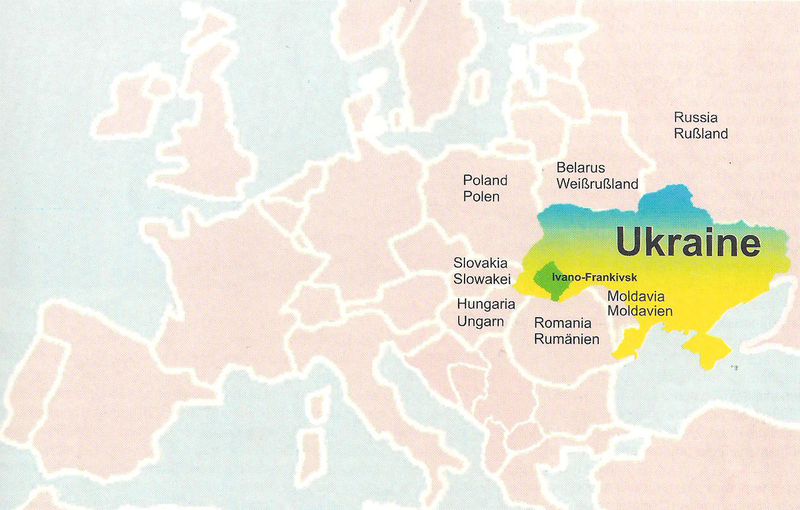 Surrounded by 7 countries, 5HS Ukraine - an independent sta¬tes since 1991 - is indisputably an East-ern European country. Seen from within the European Union, however Ukraine also forms a bridge to Russia and the wide expanses of Asia which begin be¬yond the Volga. With a surface area of 603,700 sq.km, Ukraine is larger than France, its population of 51 million slightly lower than that of the United Kingdom. The region of Ivano-Frankivsk cov-ers a total of 13,900 sq.km., which ac-counts for 3% of the total surface area of Ukraine, and a population of 1,467,000, 2.9% of the overall popula-tion of Ukraine. The climate is temperate, with mild and snowy winters with an average tem¬perature of-5° C, and pleasant summer months with an average temperature of +18° C.
This map shows the rural characterof the region. 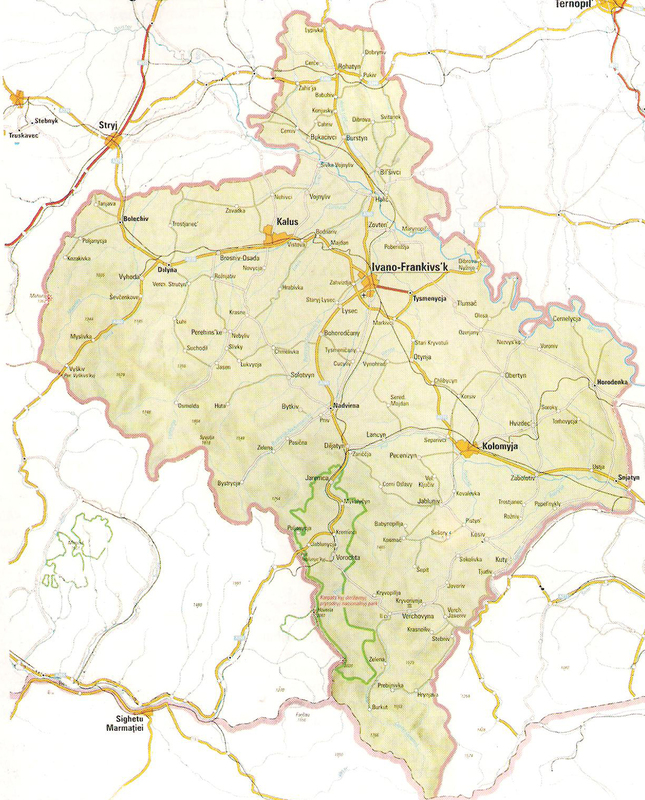 Its overall population of 1,467,000 is distributed among around 40 small towns and 750 villages and the capital Ivano-Frankivsk has 237.000 inhabitants. The area is, characterised by its forests which cover 43% of the territory. Geographically, the region (known in Ukrainian as "oblast") may be divided into three different areas: the plains around the Dnister river in the north, the hills of the Precarpathians in the centre and, lastly, the extended, densely wooded mountain ranges of the Carpathians in the south. 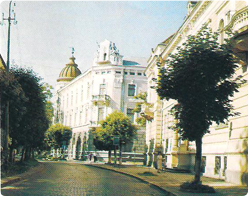 If Christianity and a multitude of religious convictions are one of the foundations of European thinking, then the Ivano-Frankivsk region is a living example of European heritage. The advancement of Polish rule from the 14th century onwards was accompanied, as so often in history, by corresponding changes in religion. The Polish kings and nobles belonged, as did the Polish settlers, to the Roman-Catholic Church and, alongside the propagation of the Catholic faith, they furthered the teaching of the Polish language. The majority of Orthodox bishops finally succumbed to pressure to conform in 1596, when they placed themselves under the Pope in Rome at the congregation of churches in Brest. This marked the emergence of the Greek-Catholic Church, which was only dominant in western Ukraine. 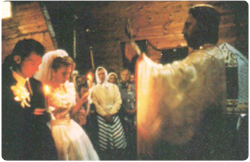 Despite its allegiance to Rome, the Greek-Catholic Church retained the orthodox Slavic lithurgy and the former organisational structures and administration, as well as allowing priests to marry. The traditional Orthodox Church was only able to retain its hold with some difficulty in the Ukrainian villages of Galicia. The orthodox wooden churches of the Hutsuls, with their rich carvings, for example in Kolomyia and near Vorokhta, are particularly recommended to visitors. 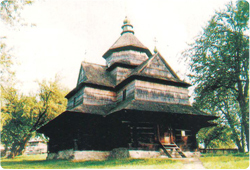 (See below the wooden Nativity church from 1615, in Vorokhta). Following the heyday of church building in the 19th century (see above Church of the Virgin Mary in Nadvirna, the second largest church in GaNcia), most churches were closed or misused for commercial purposes under Communist rule. In the meantime, these religious buildings have been returned to the churches and are now being restored with great care by the local communities, with considerable financial support from the state. Everywhere, new and sometimes very large churches can be seen springing up within a surprisingly short space of time, all this in spite of the poverty (see below the recently completed Russian Orthodox Church in Kolomyia). 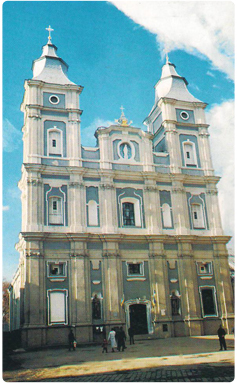 Hundreds of thousands of Ukrainians all over the world also support the construction of new churches with generous donations. The Greek-Catholic Church, which was banned during the Soviet period, is once again free from all constraint. The new conflicts within the Orthodox Church between a Russian and an Ukrainian Patriarch since Ukrainian independence is only understandable in the political context. 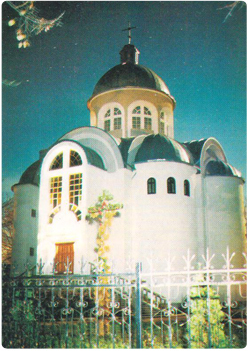 The new role and significance of the Christian churches can be witnessed in the newly acquired imposing residence of the Bishop of the Greek-Catholic Church in Kolomyia, namely, the former Communist Party building, which was built in 1951 at great expense (see picture right). 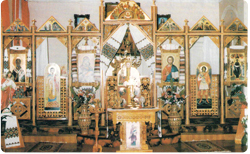 Orthodox and greek-catholic churches are immediately recognisable to the western tourist by their iconostasis. This richly decorated golden panel with its icons depicting Christ, the Virgin Mother, the angels, saints and the patron of the church separates the worshippers from the altar (see picture above). Even in long church services, the devout churchgoers appear deeply moved by the splendour of the Slavic lithurgy and church music. Baptisms and church marriages are once again very popular. The crosses in the villages and on the roadsides are decorated with flowers and wreathes and in Christian funerals, the dead are carried to the graveyard in an open coffin, accompanied by the priest and the mourners. 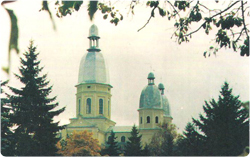 The Christian churches receive considerable support from the Ukrainian state and in many schools, the schoolchildren again receive religious education. In their isolated Carpathian villages far away from the few towns in Galicia, the people learnt to produce their clothing and household goods themselves from local materials. They passed on their skills and knowledge from one generation to the next. 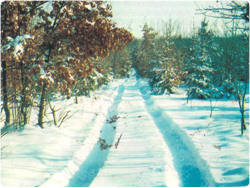 Wood manufacturing developed amidst abundant forests and the clayey soil was well suited to pottery and ceramic work. The fine wood carvings, containers and religious objects, made from local woods and incrusted with metals, pearls and polished stones, will certainly be of great interest to tourists. The ceramic plates and bowls painted with scenes from rural life, mythology, nature and the animal world, traditionally painted in yellow, green and brown tones on a light background, are also very attractive. 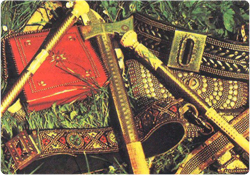 Leather products made according to the technique of cold and hot pressing, often decorated with metal, as well as a wide variety of jewellery made with metals and rare stones, can be purchased at very low D rices. Colourful textiles are one of the most important features of traditional Ukrainian folk art. Many village families embroider their clothing and all kinds of cloths with fine colours and patterns. Villages have their own patterns by which the wearer can be recognised. The interiors of the houses are decorated with woven rugs, embroidered tablecloths and cloths as well as warm woollen blankets, known as "lizhnyks". 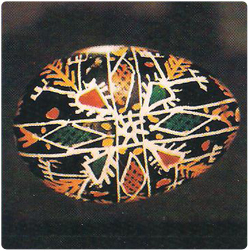 One artistic temperament is exempli¬fied by the ancient Ukrainian tradition of Pisanka, painted Easter eggs. The patterns and colours differ from region to region across Ukraine. The criss¬crossing lines symbolize fertility, the rings and lines have feminine and masculine significance. 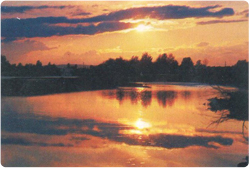 In the different colours, the natural environment is depicted in the form of water, sun, fields and meadows. In the tradition of their ancestors, still some people believe that these painted and consecrated eggs protect them from evil and from lightning. 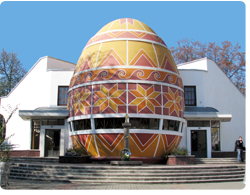 Right next door, the painted Easter eggs can be admired in the Museum of Pisanka. 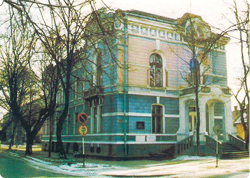 Nadvirna History Museum, opened only recently in 1995, is situated on Shevchenko Square. In seven rooms, the visitor is acquain¬ted with the changing history of the town and region. In Ivano-Frankivsk, the Art Mu¬seum on Sheptytskyi Square and the History Museum on Rynok Square are well worth visiting. 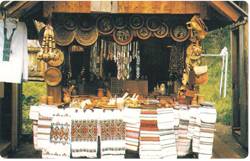 (Pic¬ture below) The town of Kosiv is the most important centre for Hutsul Folk Art. All kinds of wood carving, woven - fabrics and embroidery, ceramics and metal objects can be admired here. 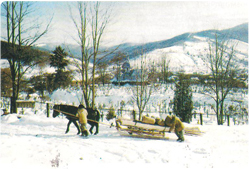 In 1939, a College for Folk Art was founded in Kosiv, which also houses an interesting mu¬seum. Some fine examples among the many impressive wooden chur¬ches which are typical for this re¬gion can be found in Kolomyia (1587), Kosiv (1825), Rohatyn (1598), Yaremche (17th century) and Vorochta (1615). of all. Take it! And so it was that God had to stay in heaven and the Ukrainians took over the land which was intended to be a paradise on earth. (Maria Saslawskaja and Hans Sewik, "Ukraine", Südwest Verlag, Munich, 2nd edition, 1994, 14). 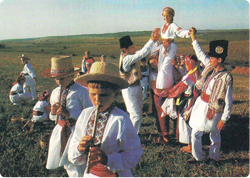 In comparison with Western Europe, the people in Ukraine are more closely linked to nature and lead more rural lives. Many families from the towns spend the weekends outside the towns in their dachas, summer houses wirth large gardens, where they need to grow a large amount of food. The political past has left deep traces in the lives of almost all Ukrainians and one should be careful not to pass judgment too quickly. The building of a democratic constitutional state and a socially responsible market economy is a very slow process and the enormous difficulties of the present do not give much cause for optimism. There are still few opportunities for those with expertise and enterprising ideas, but one decision has already been taken. The people in Western Ukraine want to be part of an European future, and no longer remain third-class Europeans, outside the "European house". Great hopes are set upon foreign visitors, whom Ukrainians regard as an enrichment and a perspective for their future. It is a pleasure to get to know these hospitable people and to experience their warmth and kindness. 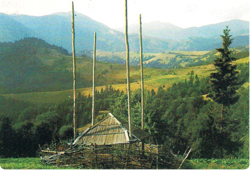 The Hutsul people are an impressive example for the close bond between people and nature. For centuries they have been living in the remote valleys of this mountainous region. It never made much differen¬ce whether they were governed by the King of Poland or the Emperor in Vienna, and the church bells still rang out under the long period of Soviet rule during the three years of German occupation. "So the Hutsuls live here, a mountain people that has small, shaggy ponies, tends its sheep and loves its forests but not the authorities. They drink large quantities of their own home-distilled vodka and probably celebrate more orthodox holidays that the Patriarch in Moscow. 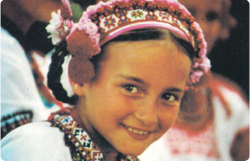 The people speak Ukrainian with a Polish accent and many words are derived from Rumanian. No stranger can quite understand it. (Volker Handloik, "In der stillen Welt von Kriworivnja", Geo 7, July 1999). Here there are farmhouses made only of wood and in winter the wolves can be heard howling. The families spend the days in a large room which also contains the loom. The children weave sheep's wool and bake fresh cheese to "brynza" in the oven. The dishes are simple: home-made bread and cheese, preserved pork, dried or pickled mushrooms, blueberries, cabbage stew, borscht, pumpkin gruel, salted fish, pickled cucumbers, eaten with potatoes and sweetcorn from the low-lying valleys, and lots of sour milk. Their Christianity is mixed with pre-Christian cus¬toms. Devil's women, people with cloven hooves and the "unclean" who steal the souls of the dead, still haunt the land. There has never been much money around, and now it has become even rarer. Bartering has taken its place and ensures the necessary movement of goods. Cheese, wool and sheep are exchanged for flour, oil, salt and potatoes, but also for school exercise books and shoes for the children. If the touris 1ts should ever return, they will be able to "exchange" their colourful woven and embroidered cloths and blankets for money. However, their love of festivities has remained as strong as ever. 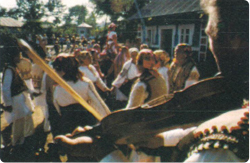 A wedding with hundreds of guests, who often bring their own food and drink, lasts for three days with dancing, songs with endless numbers of verses, drinking toasts and new supplies of food, until exhaustion dictates that the festivities must come to an end. If the priest were not to drink his gastric tonic as a precaution at the beginning of the festive days, a Carpathian tea made of storks' beaks, celandine and basil, then he would certainly not be in a fit state to perform the church wedding on the third day.